Bali Restaurant Kakiang Bakery offers fresh breads every day displayed in the counter. This tiny bakery is located on Jl.Pengosekan, south of Jl.Hanoman Ubud, it's only about 5 minutes on foot from monkey forest. 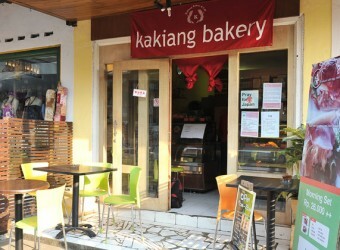 Kakiang Bakery provides a wide choice of breads mainly French bread, rye bread including Danish, croissant, donut, etc. Sandwich, gratin, coffee, pancake also available at this bakery. I think Kakiang Bakery is the most delicious cake shop in Bali It`s located in Ubud. It`s also famous among local people. It was the second time I went to that cake shop. I ordered strawberry shortcake without hesitating I even thought I want to bring it to my stay hotel. There is a wide selection of drinks available. It could be good for brunch.